Posted 02-12-2013 by Dale Bohman. 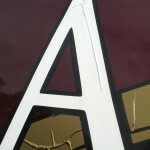 There are two different types of vinyl used for lettering and graphics, and many different quality levels. They can make a BIG difference in how long and well your vinyl jobs lasts and looks! Cheap vinyl used for the black layer has shrunk and wrinkled the white & gold vinyl on top of it. This last week I was helping a customer with some vinyl lettering and reviewed some existing installations that they were not happy with and wanted to fix. I got to the installation and saw the pictures shown here. This install was only 2 years old! Black vinyl under the gold shrinking has produced this unusual circle wrinkle. installed those graphics used cheap vinyl, for the base (calendered). The gold vinyl is always generally a higher quality (Cast vinyl), and the installer put cheap black vinyl under it. 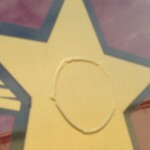 Cheap vinyl shrinks, in this case a lot!, enough that it formed the wrinkle “ring” shown. Vinyl is made two ways, 1- Calendared and 2-Cast. Calendered Vinyl is made by combining the ingredients needed and then using rollers to roll out the sheets like a rolling pin will pizza dough. This is a faster cheaper process producing less expensive film. However, calendered vinyl retains some “memory” of its original state. When heated up the vinyl will begin to shrink, crack and sometimes peel. Calendered vinyl is usually rated for 1-5 years. It is better suited for indoor or temporary applications. Cast Vinyl is made in a way that is similar to baking brownies. Ingredients are combined and then spread out on a sheet and baked to form the vinyl. The result is a more stable and thinner vinyl that doesn’t have the shrinkage issues of cheaper vinyls. Cast Vinyl is usually rated for 7+ years and is recommended for vehicles. Due to its slower manufacturing process it is more expensive. However, the old adage holds true, you get what you pay for. So before you take someone’s word that they can do it cheaper, find out EXACTLY what they will be using. The main vendors for quality vinyl are 3M and Avery, but ask about the specific vinyl. Also be aware that if you pick a specialty color, your vendor will have to purchase an entire roll of the material, so you may pay a premium for the color you pick.